Even you are Vegetarian or not, you will love these Veggie Burgers they are packed in flavour, low in calories, healthy and makes a tasty meat free meal. As we all know most kids like burgers now it’s time to get them involved in doing their own. The advantage of this one is that it contains some of the “five a day” , therefore this could be an incentive to get them eat their vegetables. 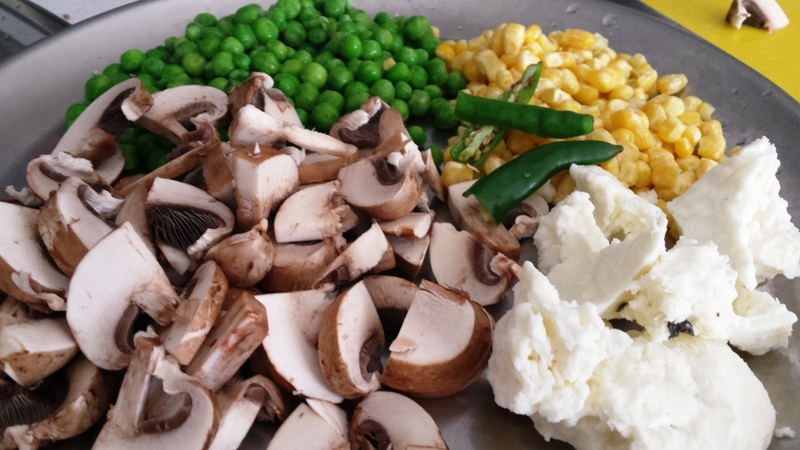 Put the defrosted vegetable – sweet corn, peas in a large bowl. Heat some oil in a pan; add the chopped mushroom and sweat until all the moisture have evaporated. Remove from heat set aside to cool down. In a food processor, mix together the cooked mushroom, half of the defrosted sweet corn and half of the peas, herbs, spices, flour, and blitz to a fairly rough paste. Season well. Now add the sesame seeds, give it a quick pulse to combine. Empty the rough vegetable paste into the rest of the sweet corn and peas, mix thoroughly with your hand – which I think is the best way to do. (I purposely don’t put all the sweet corn and peas in the food processor are because I like to see some texture in the burger). Divide and shape the mixture into four equal-sized patties, roughly 2cm thick. I use a pastry cutter to shape my burgers (as seen in picture). By doing so I get the same thickness around and same shape. Place some of the mixture inside the cutter then layer with few slices of Hallumi cheese followed by another layer of the mixture – therefore sandwiching the cheese in between the vegetable mixture. Continue until all four patties are done. Please note at this stage the patties are quite delicate. To unmold by using a palette knife carefully lift and remove from the mould. Place on a lightly flour-dusted tray, turning them over in the flour to coat. Place in the freezer for around 10 minutes to firm up, when ready to eat remove from the freezer and leave in the fridge for a few minutes. To fry heat some olive oil in a large frying pan over a medium heat. Fry/Cook the burgers for 10 -12 minutes, keeping the heat on medium so they don’t burn. Turn halfway and pressing down with a fish slice to get them nice and crispy on the outside and almost melting away inside with the cheese. Serve on a burger bun, or a thick slice of loaf with slices of tomatoes, some green salad.